In Vermont, local music festivals have some enduring and endearing qualities. One such foundational tenet is, obviously, a strong slate of homegrown music. While many fests might draw attention with a big-name national headliner or two, more often than not the musical menus have a distinct locavore flavor. So do the food menus. Your little two-day bash ain't no kind of local music festival without at least three hip food trucks and sponsorship from one of the state's roughly 7,382 breweries or cideries. And it needs to be in an idyllic setting — ideally along a lake or river or, even better, in some remote mountain hollow or pasture with minimal cell service. Oh, and there should probably be some visual art component, too. Because why not? If that all seems a touch formulaic ... it is. But it's a damn good formula, as evidenced by the likes of the Manifestivus, the Frendly Gathering and Solar Fest, to name but a few Green Mountain faves. The template for a classic Vermont music festival is so potent, in fact, that it's been transported across state lines. To wit, the Otis Mountain Get Down, which — with apologies to the Vermont Music Fest — might just be the Vermontiest music festival of the summer. Aside from the fact that it's in Elizabethtown, N.Y., OMGD — which runs this Friday through Sunday, September 9 through 11 — checks off every box for a quintessential local music fest. Tasty local food vendors? Uh-huh. A rustic-chic aesthetic thanks to cool outsider art? Yep. A remote woodsy setting affording loads of camping space? Oh, yeah. A top-notch musical lineup loaded with Vermont bands? Done and done. Vermont bands are the foundation of OMGD and have been since the event's inception in 2013. Highlights this year include vintage R&B darlings Kat Wright and the Indomitable Soul Band, psych-pop phenoms Madaila, Smooth Antics offshoot smalltalker, jazz-hip-hop-fusion act Billy Dean & the Honor Roll, rockers Apartment 3, bilingual indie-folk songwriter Francesca Blanchard, and blues-folk songwriter Eric George, among many others. Why the reliance on Vermont bands at an upstate New York festival? Aside from proximity, it's because the OMGD's roots are actually in Burlington — specifically, a South End apartment shared by eight of the festival's cofounders dubbed "the Range." "We had a basement with a bar, a mini-ramp and a stage," said Quillan George recently at a Burlington coffee shop. "So we'd have shows all the time." George parlayed the connections he made booking bands in the Range basement into booking bands in a nicer basement: As the talent buyer at Burlington rock venue Signal Kitchen. He's now based in Portland, Ore., but still books for SK and serves in the same capacity as talent buyer for OMGD. One of George's Range roommates was Zach Allott. His father owns Otis Mountain, which is a rope-tow ski area in the winter. Every summer from 2002 to 2009, the elder Allott hosted a small bluegrass festival on the grounds. 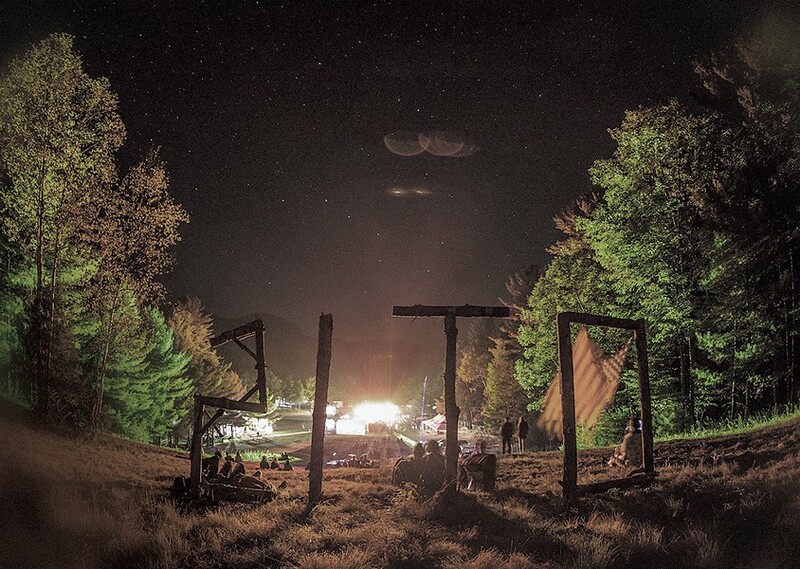 While visiting the site in summer 2013, George and Zach Allott hatched the idea of hosting shows at the mountain again. "We thought it would be really small, like, a few bands and a bunch of our friends," said George. But the idea snowballed. Six weeks later, the first OMGD was held with 30 bands and about 700 people in attendance. "It ended up being a lot bigger than we first thought," George said wryly. Here, too, is another classic Vermont fest-ism: the origin story. A group of friends decide to throw a party with bands outside in the summer. It goes really well, so they turn it into a music festival. If you switch the names and location, we could be talking about the Frendly Gathering or any number of other fests. "Well, we're not pro snowboarders," joked George, referring to Frendly cofounders Jack Mitrani and Danny Davis — who are, in fact, pro shredders. "A lot of us do snowboard and skate, though." Like Frendly, the OMGD is experiencing, if not quite growing pains, identity issues. Specifically, how big its cooperative organizers — a 14-member group of twentysomethings — can grow the fest, and how big they want it to be. This year's festival is expected to draw 2,300 people. "One of the things that's really special to me about the Get Down is the scale," said Leanne Galletly, OMGD's secretary, archivist and administrative coordinator. "It's small, and intentionally so. So it really does feel more like you're partying with your close friends than being at a huge festival." "We're probably never going to have huge bands at Otis," added George. "And that's something I take pride in. We really look for cool, up-and-coming bands that we're excited about and want to introduce to our friends." That's not to say the Get Down suffers a shortage of star power. Rather, it's that the OMGD crew, like their colleagues at Waking Windows, have a knack for booking acts just before they break out. This year's slate of bands-on-the-verge includes art-pop outfit Arc Iris, folk-pop duo Lewis Del Mar, southern-soul-tinged indie rockers Valley Queen, Montréal synth-pop band How Sad and Philly rocker Ron Gallo, among others. Pressed to say who he's personally most excited to see among the fest's 30-plus bands, George offered a pair of highlights. "Khruangbin are crazy," he says. That's a Texas-based psych-rock band rooted in 1960s Thai funk and surf music. Crazy might be an understatement. George is also a fan of Mal Devisa, aka Deja Carr, a teenage bassist, singer and rapper based in Northampton, Mass. Pitchfork raves about her: "Mal Devisa's voice is raw, collected and honest, scaling heights that you may have forgotten were there." Even given such a strong and diverse lineup of music, the Otis Mountain Get Down retains its humble charm. And that, too, is an endearingly fundamental quality of great local festivals. At its most basic level, the OMGD is just a big party. "We started doing this right after college," said George. "So, for a lot of us, the Get Down is the only time of the year we see a lot of our friends in one place." "There's a really cool community around the festival," added Galletly. "It's like summer camp." Correction, September 7, 2016: "The Range" was home to eight founding members of the Otis Mountain Get Down and was in Burlington's South End. A previous version of this story contained an error. The original print version of this article was headlined "Get Down on It"